Lesson: File management and the use of utilities in SketchList 3D. Summary: There are several utility functions is SketchList 3D woodworking software that will save you time and work. This lesson reviews what these are and how to use these utilities. From your point of view your work with SketchList 3D is organized by customers and projects. From the software perspective all projects are stored in a single database. When you may import and export projects you are working with a portion of the entire database. Understand the SketchList 3D database. Where is it stored and how it works. Learn how backups of the database are taken and what to do to restore the database if you ever need to do so. Learn about auto backup and how it saves your database each time you run SketchList 3D. Understand how to restore the main database if you ever need it. Learn to use the tools that allow you to change all or selections of objects and containers from one material to another. Learn what the setup options are and what they do. Change various materials in your design. SketchList 3D manages all aspects of saving and retrieving data for your projects. The project information is saved in a database. Another file named texture.txt for storing texture images since their size would slow down database access. When you create a new project it is saved in the database. Each time you use SketchList 3D a copy is made of the entire database. You can restore a backup at any time. Multiple copies of the backups are saved. By default user specific data is stored in hidden folders so users must enable option in their OS to show hidden folders. 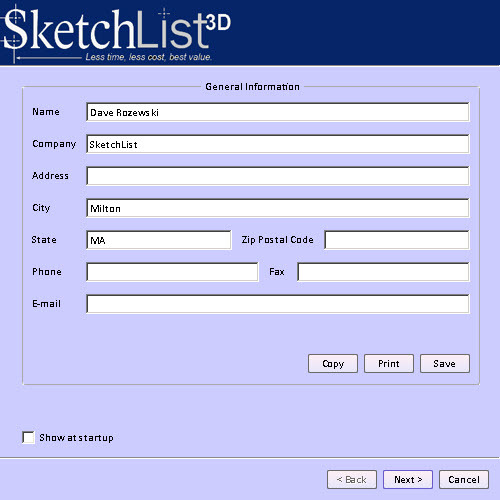 Under the file menu option of SketchList 3-D are nine functions that are used on either a project or the database. New project – creates a new project. The form that opens allows you to record detailed information about the project. Open project – allows you to choose a project from a list of all projects to open. Quick project setup – a fast way to create a project with a default size of 100 units by 100 units by 100 units. The project opens an assembly of the same size will have already been inserted. Save project as – allows you to take the project you’re working on and save it under another project name. This is useful if you are working on a design that is going to use an existing project with modifications. 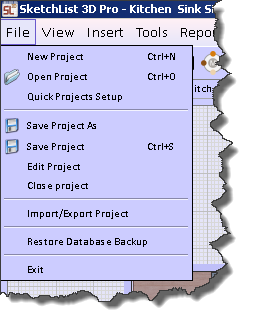 You can take the existing project save it with a new project name and make the modifications necessary. Save project – saves the project are working on with the existing name. Edit project – let you change information about the project including size. Import/export project – creates that contains all of the information about the project. This is useful for storing a project as additional backup or sending a project to another SketchList 3-D user. When you select export the form opens with a list of existing projects. Select the project you want to export and click the export project button. You want to import a project click the import project button. A file finding form will open listing all exported projects at a given location. Select the project you want to import and click okay. Restore Database Backup – this allows you to return to a copy of the database as of a specific date in time. This is useful if something has gone wrong with your current copy. Each line in the text display box links to a copy of the database. You can select by the date and time the backup was made. 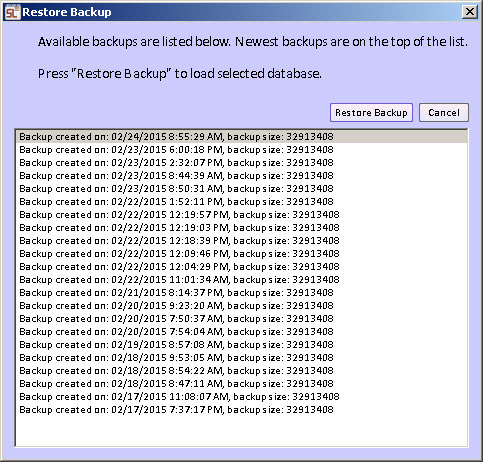 Select the backup copy you want to restore and click the restore backup button. You will be prompted if you’re sure you want to overwrite your existing database with the backup. The setup menu item gives you access to six different functions. User information form. You use this form to enter or edit information about you and your company. This information then can be included in the headers and footers the reports of SketchList 3D woodworking software. See the reporting lesson to learn how to do that. 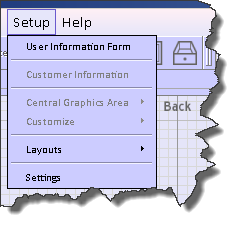 The customer information menu item opens the main project form. At the bottom of that form you can enter or edit information about a customer. Layouts – provides the ability to create and save the current configuration of the various windows on your SketchList 3D computer screen (s). You can save and call various layouts depending on your needs. Settings – this menu item is used to gain access to the form for saving various operational settings in SketchList 3-D.
Automatic container resize. Checking this box allows SketchList 3-D woodworking software to automatically increase the size of a container. This might be helpful should you change the size of a content of that container in such a way it would exceed the size of the container. Rather than not being allowed to do that SketchList will handle that situation. You should use this setting carefully because you may not want to have this flexibility at play in your design. Check for new messages. Periodically part of the SketchList update function may issue an important message. You can allow or disallow those messages by checking this box. Auto save. 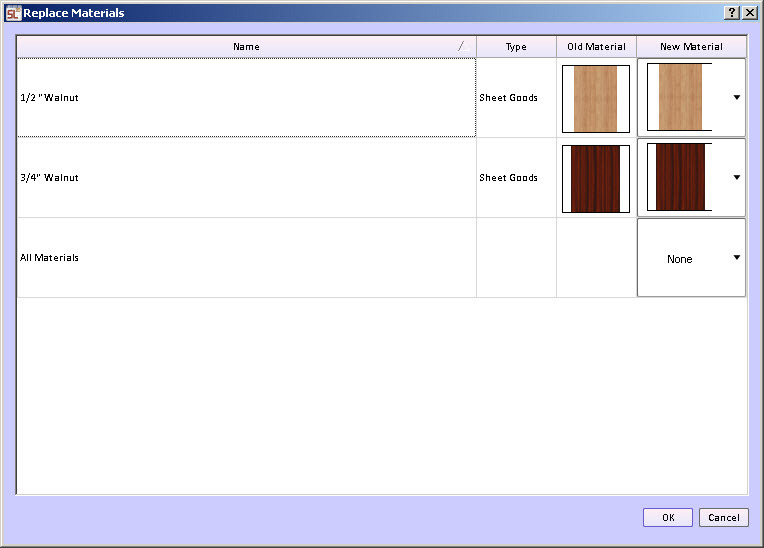 Periodically SketchList woodworking software will automatically save your project. You may want to turn that off if your project is so large that the time it takes to save it is becoming a problem. Light color. You can change the appearance of the photo quality renderings by selecting a different light color. Create statistics report. Generates an interesting report about the number of objects in any given project or assembly. Reset all rotations in a project. This was more important as the ability to rotate containers and objects was being developed. It functions to set all rotational values to 0°. Think carefully before you choose this reset. Current zooming level – in SketchList 3-D woodworking software you have the ability to hold down the Z key on your keyboard to zoom. The amount of the amount of zooming is set by this slide bar. Check for updates. When SketchList uploads new builds of SketchList 3-D woodworking software to the server those new builds are available for downloading to your computer. If you check this feature that downloading will happen automatically. Of course you will be prompted . You can force a check for updates by clicking the check for an update button. There are times that you might want to change materials in your design. You can do that on a board by board basis by selecting a board and clicking the board definition tab the upper right portion of the SketchList 3-D screen woodworking software. 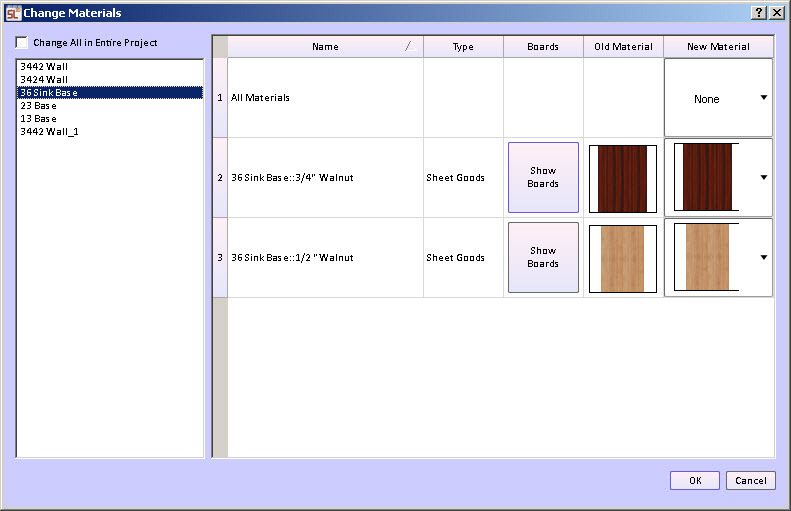 If you have a need to change the material of many boards you can use the change material functions. There are two icons in the icon bar at the top of the screen that give you access to forms to do this. The icon to the left will open the form that allows you to selectively change materials by either the entire project or just within selected assemblies. If the checkbox labeled Change all in Entire Project is checked then all materials of one type be changed to the new type you specify. If the checkbox labeled Change all in Entire Project is unchecked the list of assemblies in that project will be available for selection. Select the assembly for which you want to change the material. All materials used in that particular assembly will show up in the box on the right. If you want to check with which boards use that material click the “show boards” button. The material currently being used as shown in the column labeled Old Material. You can change that to the material you want to use by clicking on the down arrow in the column labeled New Material. Select the material the Select button. NOTE: When you are finished you must click the exit change button the top of the form. There are times when you simply want to change the appearance of materials in the design and keep the other aspects. In that case click the second change icon. Select the new material. When you do you will be prompted to save the project under a new project name. This gives you an opportunity of taking the project name and modifying it to indicate that it is now constructed with a different material. For example you might take the project named kitchen and change it to kitchen – Maple.